The truth is that we really do not have a favorite brand of antivirus protection software. Like death and taxes, antivirus software is not optional in today's world. Often the antivirus and related malware detection applications however behave at a level equivalent to some viruses. And they typically steal processing power along with their incessant updates making computer use much less enjoyable and efficient. Users are further placed into the unsavory position of having to choose sometimes between antivirus packages that have excellent detection but high resource utilization versus antivirus software that has lower detection accuracy but also lower resource usage demands. Often Norton/Symantec Antivirus and McAfee brands have been the causes of PC slowness. Over the years, however, we have heard of more rogue problems with Panda Antivirus than any other. And today was no exception. Yesterday we updated an end user's main executable with a newer version simply as a part of an update and because it might have helped with an issue they were having. Everything was working fine until an automatic update occurred on that system this morning. The update at least in part involved Microsoft updates (this was on a Windows 7 Ultimate operating system). The 19 Microsoft updates that were installed rendered the PC unusable for a time, a story that is all to common (and we recommend managing these on a non-automatic basis for exactly this reason). 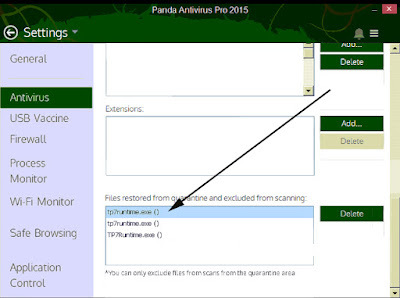 The end user though was also using Panda Antivirus 2015, and we suspect that a Panda update also occurred. After these updates and after having used the executable associated with the software earlier today that we had updated yesterday, the executable simply vanished along with the desktop icon associated with it. What was suspicious about the file? Because it was downloaded via a web service (in this case via file transfer protocol)? Yet that's where pretty much everything comes from these days. No other details whatsoever? No indication of the publisher name or the digital signature date if that information is present (which it was) so that the user can make an informed decision? How would the user otherwise easily, quickly and without having a somewhat high level of expertise know what to do? How high of a burden is this to place on a end user without providing as much information as possible in a case involving a false positive as here? Won't this then encourage the user without this information to "neutralize" (a euphemism for delete, kill, remove, etc.) the threat? The "threat" once averted then cripples the end user system. Prior to adding the exclusions above, Panda's settings reflected the fact that the files had been quarantined but then excluded. And this is not the first time we have seen this happen. A different system in 2013 that was using Panda and a software package that also uses the same executable suddenly experienced the same thing and that was on system that had not changed for some period of time. Yet, these are are simply completely valid, digitally signed executables with no compression and which have been widely used on many other systems and not falsely detected as being suspicious by other antivirus software. Is it possible that users when presented with the "suspicious file" option are choosing "Neutralize" rather than "Exclude" since it is the first option and since it sounds less benign, and so the removal is actually being confirmed by the user? Yes, that is possible, and we can't be certain that did not happen in these two cases, but there have been other reports of files deleted by Panda that did not appear to involve any user interaction. In much older systems (and going back into the late 90's) we had several reports from users using Panda where false positives would occur on end user data files (and so not executable files at all) that could not possibly be infected with a virus, and yet in at least two cases Panda actually deleted the end user's data (files that just happened to not be open that Panda decided to quarantine and delete them) during daily operation of the software. We've never experienced these problems with any other commercial antivirus software programs. This points out how critical it is to exclude critical software installations such as accounting software or heavily used production systems from real-time antivirus or malware scans. False positives can and do happen with all antivirus software. And if you use Panda, you are at even greater risk if you do not do this. And also be very wary when updates occur. While Panda is not alone in having update problems, earlier this year a significant problem arose with a Panda update, see this story published on March 11, 2015 in the iDigitalTimes: Panda AntiVirus Update Problems Bricked Your Computer? Here's How To Fix Wiped Files And Restore Your PC Stability. Is the cure worse than the disease? Maybe not, but often it seems that way. Tomorrow we will will officially publish our tenth release of TAS Premier 7i. Originally released on September 21, 2005, we have published ten releases in the last ten years. Release 10 addresses many different areas of the development system from data dictionary maintenance to internal runtime handling in the event of missing program files (whether physically missing or temporarily unavailable to network connection or pathing issues). Of note however are the many enhancements relating to reporting and printing. A vexing issue that has only occasionally been reported (not just in TAS Premier 7i but also in the TAS Professional 6.x series before it) is a report image (whether actually attached or loaded "on the fly") which while appearing perfectly in order on the preview screen, randomly prints out to the printer as either blank (i.e. leaves white space) or is outlined in black. One user thought the problem started with Windows 10 but in fact it is unrelated to any particular operating system. Some users have thought it related to a printer driver issue. Others suspected that the size or type of the graphic file was the issue. In fact, it was none of these. And it also had nothing to do with anything in the TAS Premier 4GL development system itself but rather with an underlying third party component that had in turn based its image handling code on the 3GL language used to create modern versions of TAS. The use of components is a necessary part of Windows programming, but this also shows how a problem with one procedure in one underlying component has a rippling impact on everything that is then built on top of it. Finding an appropriate patch was difficult, but was something we accomplished several months ago. A "Text" option was originally provided by the original publisher of the TAS language and IDE starting with version 6, but its purpose was actually to export specific fields/columns of information in a report, and requires a special setup that is essentially report specific. Its selection would therefore result in a blank page. The RET files instead produce the text (no graphics) equivalent of any existing report including spacing (but no printer specific codes). 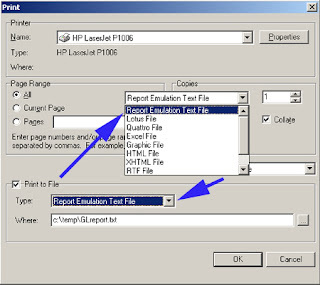 This is no doubt what was originally intended and provides users with a quick way to output text from a report somewhat similar to what was available in legacy (5.1 and prior) versions most which did not support graphic reports (with the exception of one private label version). Note though that if a report layout relies on auto-sized fields and/or its column spacing is cramped or relies on a variety of differently sized proportional fonts, you should expect that some text may overlap or be truncated, and the resolution for that, if critical, is with the design of the report layout itself, i.e. its RTM. Also included is support for the first time of report archive files (RAF). We decided against including these in the drop down box (but might add that in the future) associated with "Print to file" since end users would typically not know what they were for, plus they would no have a way to preview/print them without an appropriate viewer and there could be issues with security/confidentiality (although that is certainly true with other types as well). Instead we decided to put this powerful capability into the hands of the developer to create them when needed and we have also provided a new function that allows them to be previewed/printed exactly like any report. 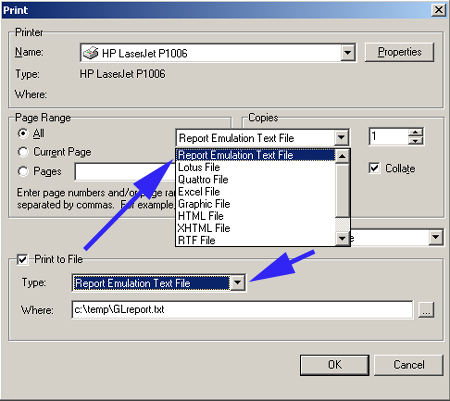 Report archive files have many potential uses for storing a report exactly the way it was initially generated, and also for generating reports after hours and then previewing/printing them later. Developers will be in the best position to implement their use. 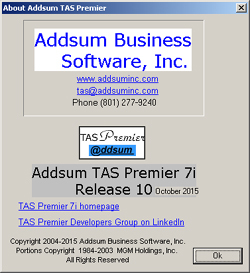 For the short explanation of other updates including in release 10, see TAS Premier 7i updates. For a detailed explanation, see the help (CHM) file that is included with the update or full download. A PDF equivalent is also separately available and now exceeds 720 pages. Occasionally there has been more than one TAS Premier release in a single year as there was in 2012 and there was one two year+ period between 2009 and 2011 without an official release. Updates however are made frequently and our goal remains to provide at least one official TAS Premier release per year. The TAS Premier 7i development system is still completely free as it has been for the last ten years. End user deployment does require an inexpensive runtime license. As future more advanced capabilities are provided, there may be charges for use of those features.